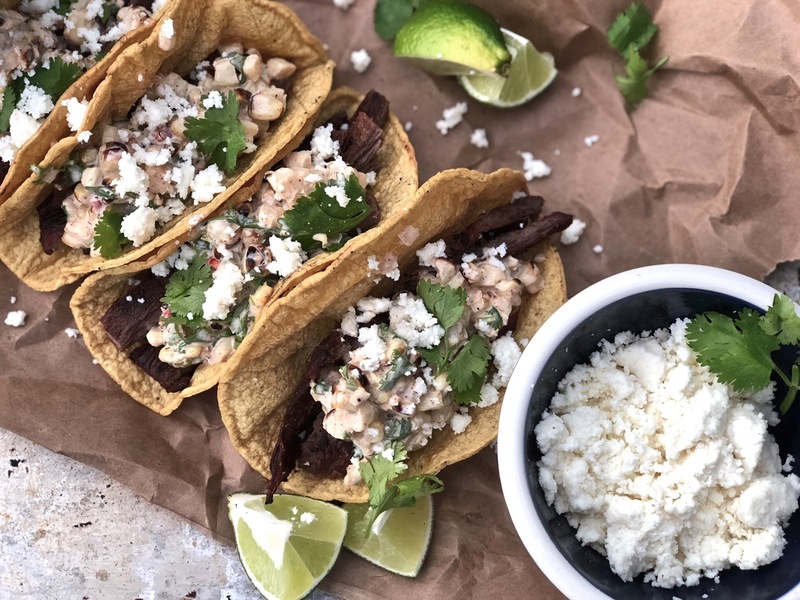 Perusing Cooking Light recently, I found a recipe for Grilled Steak and Elote Tacos from skinnytaste.com. Fast and easy! 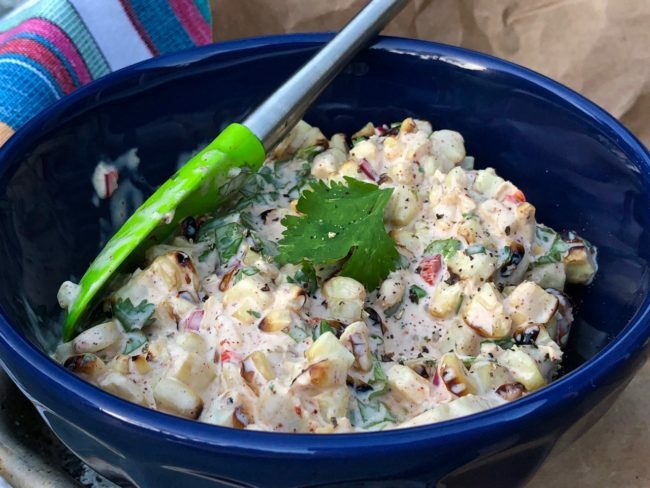 Perfect for a weeknight grill fest. One of my favorite appetizers is the Elote Appetizer from the Elote Café in Sedona, Arizona. Elote is Mexican street corn, usually grilled and rolled in mayo and cotija cheese and eaten on a stick. YUM. 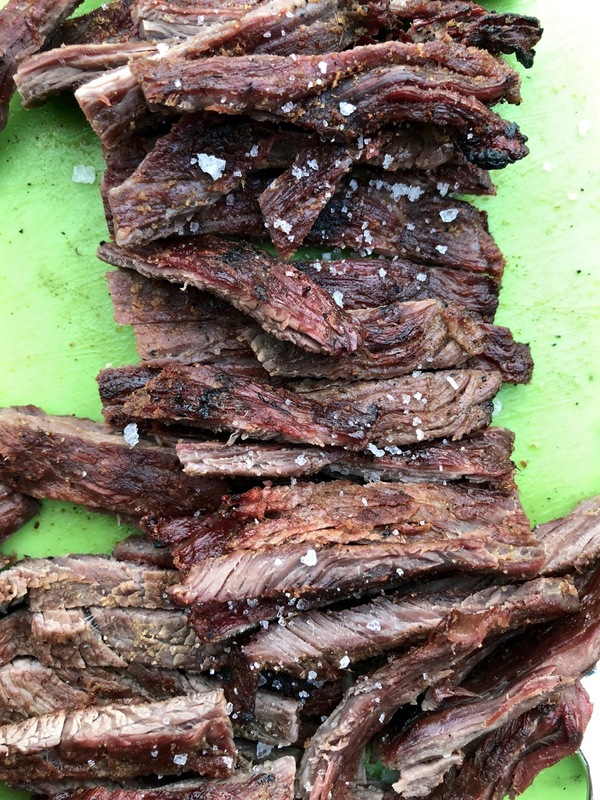 The recipe calls for skirt steak which is very thin and cooks quickly. For our usual tacos, Tom and I prefer flap meat ( which is a tad thicker than skirt steak and our butcher cuts into thinner carne asada-type pieces), but it does take a little longer to grill (but not much). We marinate the meat in Sioux Z Wow Gourmet Marinade and Lindberg-Snider Mexican Marinade. We buy the Sioux Z Wow by the gallon (really! ), and Tom adds a few tablespoons of hoisin sauce and a healthy dose of Lottie’s Traditional Barbados Yellow Hot Pepper Sauce (we buy that by the case!) to the marinade. 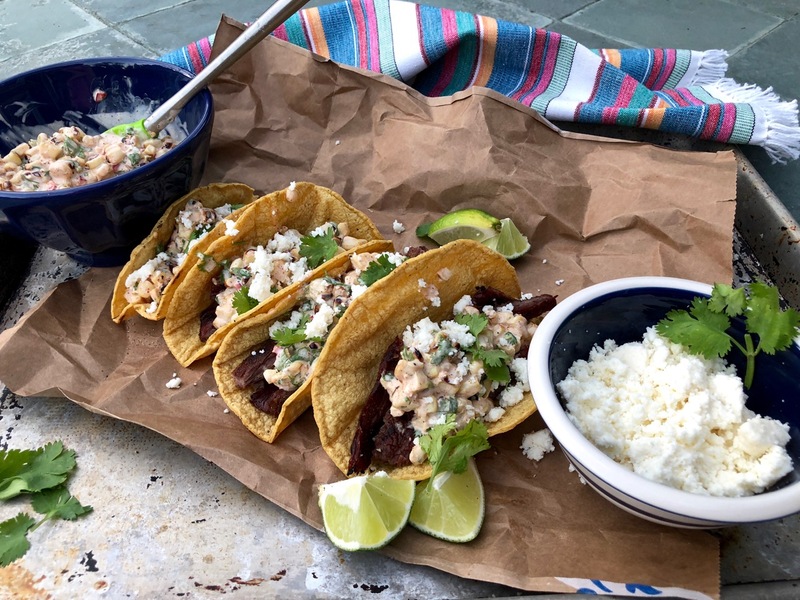 However, for this grilled steak tacos recipe, we went by the book (or in this case, the magazine). I increased the amounts of mayo and cheese when I made this recipe but include the original instructions below in case you want to keep it light. I also added in a finely diced jalapeño because … you know, we like it spicy! 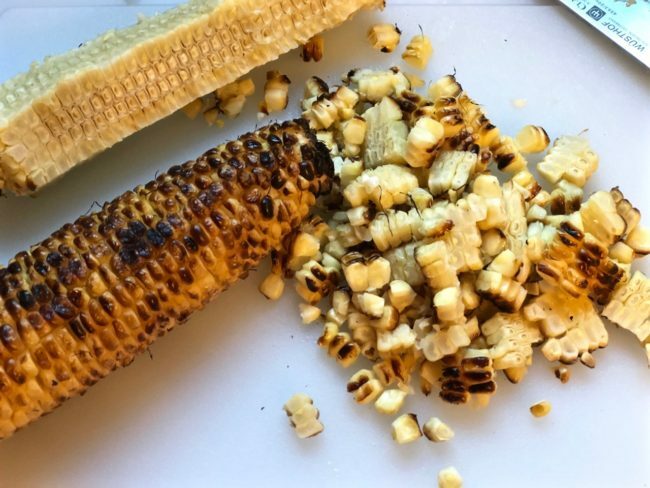 About the corn, there are many, many ways to grill it. Keep the husks on, take the husks off, wrap it in foil. I like to remove the husks, wrap it in a damp paper towel and pop it in the microwave for 2 minutes to get it started. Then put it on the grill for 6 to 7 minutes until it is nicely charred. 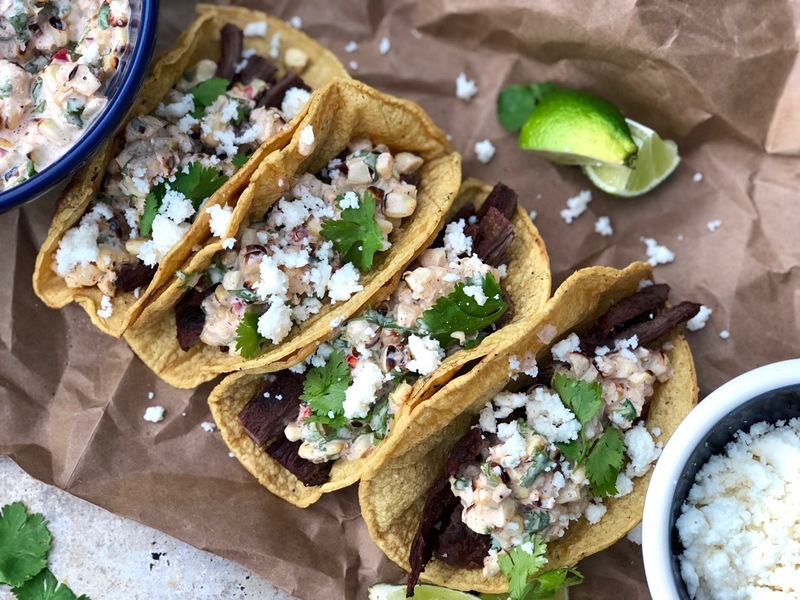 These grilled steak tacos have become one of our favorite quick summer dinners. I hope you enjoy it too! 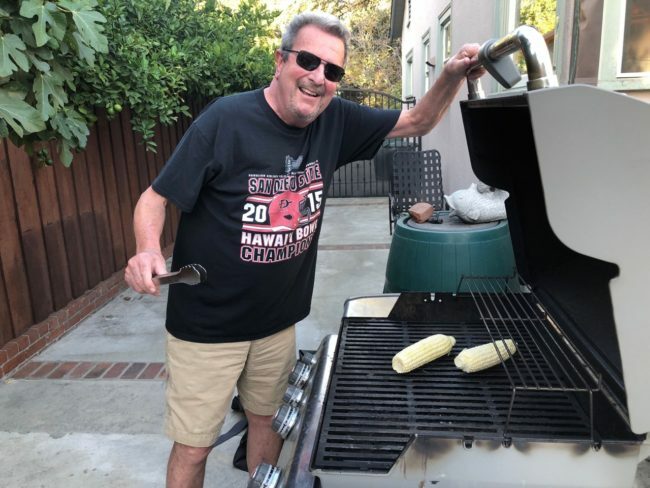 Preheat grill to medium-high. Wrap corn in damp paper towels and steam in the microwave for 2 minutes. 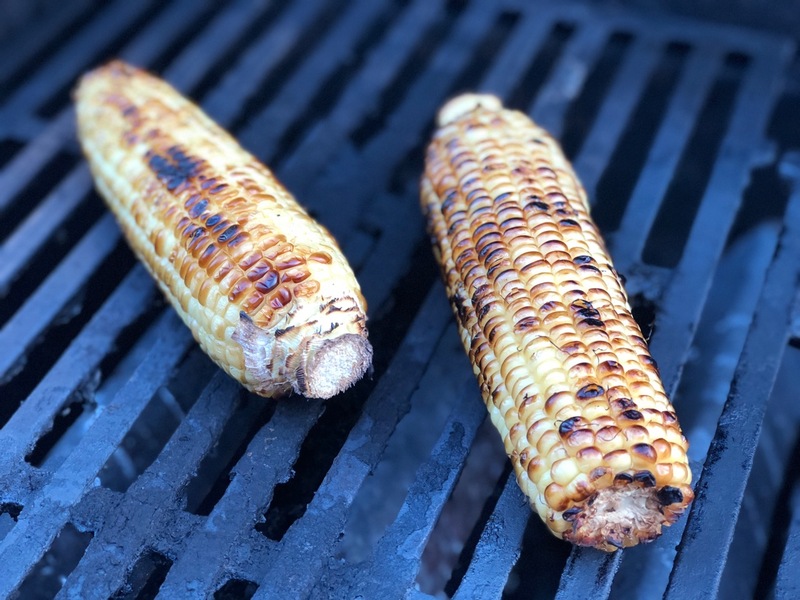 Place lightly steamed corn on oiled grates and grill occasionally turning, until slightly charred, about 6-7 minutes. Transfer to a cutting board to cool. Cut the corn kernels off the cobs and place kernels in a medium bowl. Add mayonnaise, cilantro, lime zest and juice, chile powder, diced jalapeño, and salt to taste; stir to combine. Set aside. Bring steak to room temperature and pat dry. Sprinkle steak evenly with cumin and 1/2 teaspoon salt. Increase grill temperature to high and grill steak to desired degree of doneness … 1 minute and 30 seconds to 2 minutes per side for medium-rare. Transfer to a cutting board. Quickly grill the tortillas until edges become slightly charred. Thinly slice steak across the grain, and divide among the tortillas. Top with the corn mixture and cheese; garnish with cilantro. 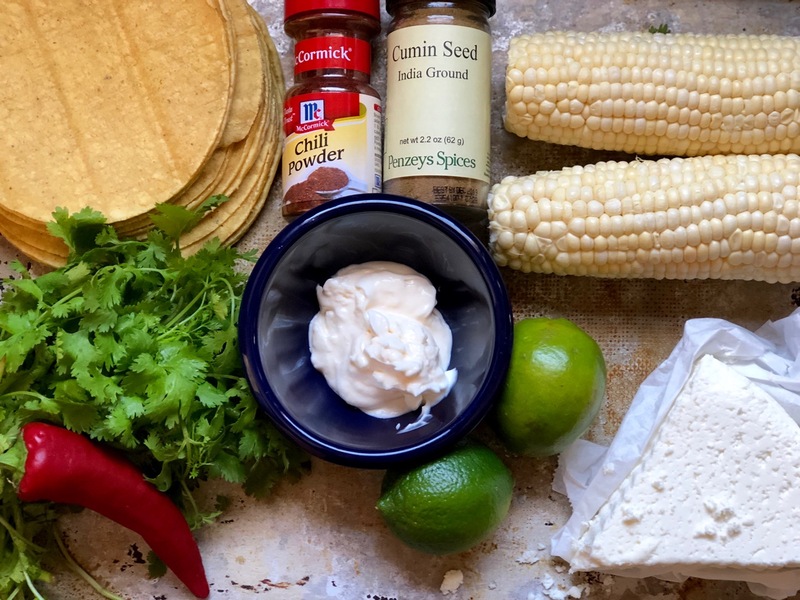 Recipe adapted from Grilled Steak and Elote Tacos from Cooking Light.